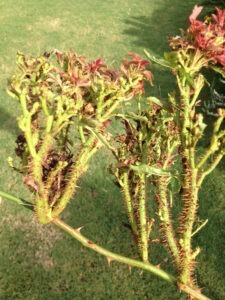 Rose Rosette Disease (RRD) has become more commonplace in north Texas. 1. Be sure your existing roses are healthy. Have you gotten your pruning done for the spring? Typically done around Valentine’s day, proper pruning encourages healthy, vigorous growth and abundant blooms. Remember the ‘3 Ds’: Remove all DEAD, DISEASED and DAMAGED canes. Also take out crisscrossed branches that are rubbing against each other and scrawny twigs smaller than a pencil. While pruning and cleaning, be sure to inspect your roses to be sure they’re free of any symptoms of the dreaded Rose Rosette Disease (RRD). If you’re unsure, read more on our handout about RRD here. 2. Brush up on your rose classifications, and be sure you know what fits your needs. Hybrid Teas have a glorious fragrance, but demand a bit more TLC from the gardener. Climbers can transform a patio or pergola, but pruning can be quite a task. Read more details on our rose list, along with all of the roses in our collection for 2019. You’ll be ahead of the game when you get here Saturday morning. If you have a specific rose you’re hoping to get, plan to be here early to get the pick of the crop (we open early at 8 am on Saturday, March 2nd). In order to provide a wide assortment of varieties, there are some that we may only have 10 of–and most of them we can’t get more of until next year, no matter how much we’d like to special order one for our guests. With the supplies limited, and the purchase time restricted, we usually have a multitude of people waiting outside for the doors to open–and early birds can come in and purchase the entire stock of a single variety. If you’ve got your heart set on a certain variety, please do get here early! With these simple tips, you’ll be ready for rose weekend success. We looking forward to seeing you this year. Learn more about this and other classses, workshops & events at NHG here.